Armor' Laptop Radiation Shield- Reduces EMF exposure from laptops. Laptops are key productivity devices – used by students, professionals, homemakers, or even just for entertainment. How many hours daily do you use a laptop? 4hrs, 6hrs, 8hrs, 10 or 12 hrs? Did you know that the laptop is one of the most significant sources of EMF? 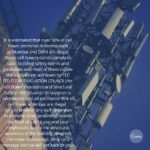 Are you aware that EMF radiation is a key health risk as declared by World Health organization? 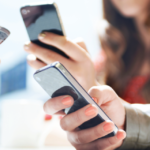 EMF stands for ElectroMagnetic fields. These are radiations generated by appliances which run on electricity. Electricity passing through any conductor creates a magnetic field. Alternating currents create magnetic fields which rapidly changing their polarity – 50-60 times a minute. This change of polarity is notified by unit called “Hertz”. When such alternating Magnetic fields, are absorbed by the body, the rapidly changing polarity can create interfere with body functions and physiology. This in turn could lead to multiple health problems. The underside of the laptop releases high frequency EMF radiations which are harmful to the human body. Federal Communication Commission, (the scientific legislative body of the US government) recommends a minimum distance of 20 cm between the laptop and user. Laptop undersides emit between 40-100 milliGauss EMF. This is 40X-100X higher than the limit of EMF exposure as per multiple studies (ref: Bio-Initiative, Building Biology, Austrian Medical Association). Moreover, localized EMF exposure on a limited part of the body makes it more hazardous and high risk. 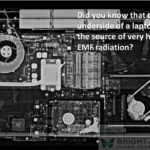 The underside of a laptop can emit upto 40X-100X EMF as compared to other sources of EMF such as transformer, HT power line, voltage stabilizer, electric shaver etc. Armor Laptop Radiation Shield reduces EMF by up to 92%. Consider the image above. 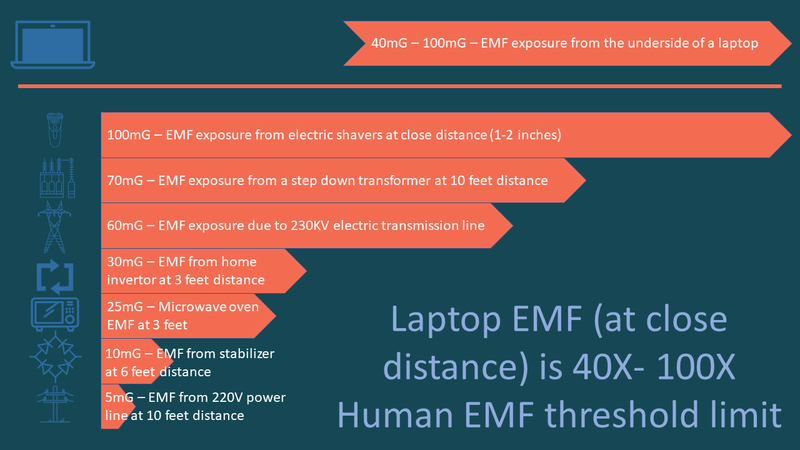 This provides a comparison of Laptop EMF against other “reasonably bad” sources of high EMF. Laptop EMF is higher than EMF from microwave oven ( at 3 feet separation) or a home invertor (at 3 feet separation). 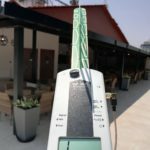 Your laptop EMF exposure could be equivalent to EMF from a transformer (at 10 feet separation) or a 230 KV electric transmission line (at 15 metre separation). Generally speaking, our awareness about risks from EMF from Laptop and the health effects is low. And while this may appear to be an oxymoron, the lap is actually the worst place to keep a laptop. Even our seating positions at offices and work spaces are mostly in violation of the 20cm FCC rule. International agency for cancer research (IARC) classified EMF as possibly cancer causing in 2002. This was basis certain empirical studies which indicated 2X increase in childhood leukemia cases due to over exposure to extreme low frequency magnetic fields. Using a laptop on the lap concentrates harmful EMF on the lower abdominal area which is especially harmful for the reproductive organs. High EMF is empirically proven to cause lower sperm counts and/or more inactive and less mobile sperms, leading to infertility. The Infra Red radiation/ heat from the underside of a laptop also directly impacts fertility. 1 degree Celsius increase in testicular temperature leads to 14% decrease in sperm production. Every year, 27.5 million couples are diagnosed with infertility. 1 out of every 5 “productive” couples, are suffering from infertility. India recorded 30% increase in infertility rate between 2005-10. 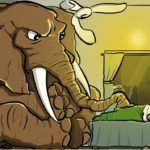 The age of computing is on us – here and now! We cannot stop using laptops. High portability demands electronic devices which are smaller and lighter. Higher computing power necessitates smaller enclosures, denser circuits and higher speeds. All of this leads to higher EMF from the devices. We can begin by measures to reduce high EMF concentration from laptops from effecting us. A step in the right direction is Laptop EMF radiation and heat shield. 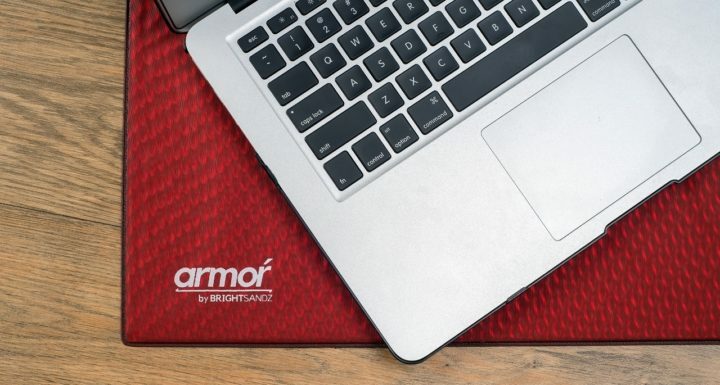 Brightsandz Clean Tech, a venture engaged in EMF assessments and solutions has introduced Armor’ Laptop EMF and heat shields. This Armor’ Laptop Radiation Shield is targeted for minimizing users risks from EMF radiation. The Armor’ laptop radiation shield is portable (6 mm thickness) and light in weight. It absorbs up to 92% EMF from the laptop. 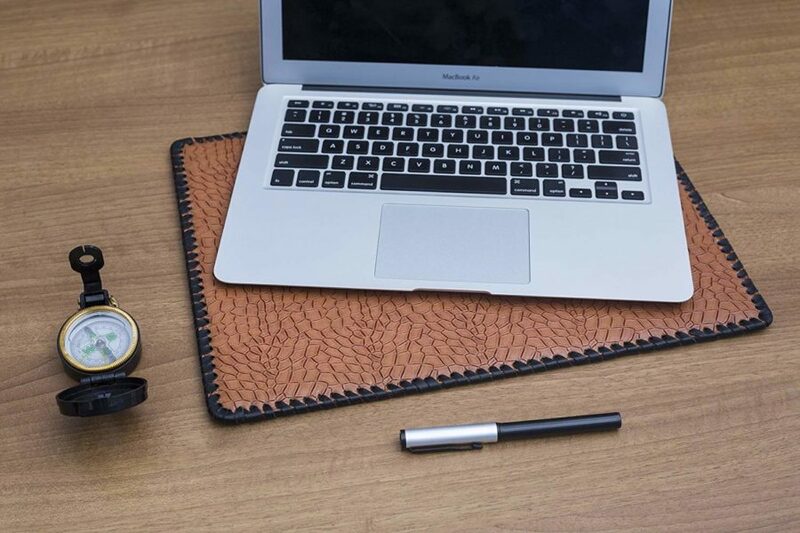 Armor’ Laptop Radiation Shield is heat resistant up to 70 degree Celsius. 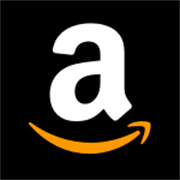 It provides up to 90% protection from RF/WiFi radiation. Just place the Armor’ between the laptop and the body, for protection against a wide spectrum of potentially harmful EMF. Armor Laptop Radiation Shields is water and splash resistant, heat resistant and flame proof, with an anti slip surface for better grip. Currently Armor is available in 2 sizes Medium (14″) and Large (“15.6”). It comes with a warranty period of one year. The military grade EMF shielding core inside Armor absorbs all EMF and RF radiation. This allows the user to spend long hours on the laptop without high risk of EMF/RF exposure. Armor is available in a wide array of designs and colors to suit everyone’s personal style statement. On an end note – here is a video of the Armor’ Laptop Radiation Shield – which visually summarizes the product, features and specs and the benefits there-of.